In the Old West, cow punchers were advised: “Always drink your whiskey with your gun hand to show your good intentions.” 5th generation ranchers tell stories of the copper-boiler-turned-still in granddad’s errantly marked “outhouse,” raisin’ Cain, and dodging the Chicagoans during Prohibition. Barn smarts and Montana farm ingredients drive the local, small-batch vinting, distilling, and brewing. Today, Gallatin County encourages us to follow the Code of the New West by appreciating the splendor of Montana’s natural beauty, being good stewards of the land, and showing friendliness to visitors and neighbors alike. Laws allow for the making and selling of small-batch alcohol without a liquor license as long as the establishment closes by 8pm and follows serving guidelines. Bozeman offers plenty of hospitality and goodwill one glass of wine, distilled spirits, or craft beer at a time. Grab your copper mug , crystal stem, or beer stein and vanquish Winter at some of our region’s best tasting rooms. Nicole at the tasting bar offers a wellspring of knowledge and mixology not on the menu, “SnowCrest Vodka, cherry Bordeaux juice, lemon San Pellegrino, and a little club soda to cut the calories, no fizz . . . I call it the Wet Willie.” A celestial experience the color of stained glass. Sorry boss, my morning coffee is already graced with Willie’s Sweet Cream Liqueur, but I still need the day off to taste all that Western Montana has to convert a teetotaler. For brides-to-be, a good wedding drink is the Huckleberry Drop (SnowCrest with huckleberry juice and fresh lemon, purple with a sugar-rim glass.) Bygone brides and well-worn grooms can make up with The Flight – 5 tasters of the 9 spirits on offer for $5.00. A Kentucky companion, and his wee terrier Kiwi, stood in the reader’s shoes for a dry run: Blackberry liquore (50 proof, a little on the sweeter side); Mixed Berry Moonshine (80 proof, sublime); Big Horn Bourbon Whiskey (80 proof, the gentleman’s drinking whiskey); Honey Moonshine (70 proof, heaven), and Montana Wild Choke Cherry liquore (50 proof, a Montana original) -- just because we’d seen frozen choke cherries in the snow on the way -- believe me the spirit of the wild fruit is more gorgeous than the original. 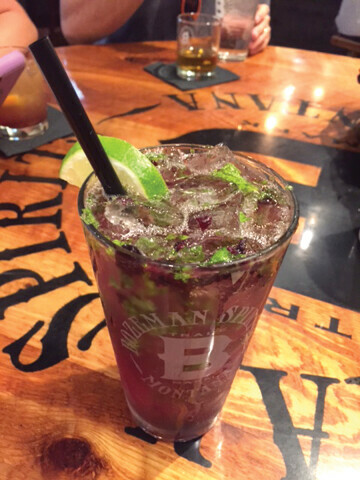 The Mixed Berry Moonshine is the unlikely result of a big-rig accident that included a driver, asleep-at-the-wheel, who delivered an accidental crop of blackberries through the front door. 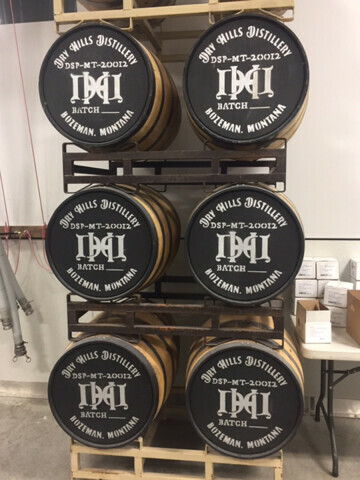 Willie, the ex-Army ranger from North Carolina, and his amazing wife, Robin, from the family ranch near Toston, MT, are distillers extraordinaire. Nicole let us try some of the barkeep’s experimental infusions. 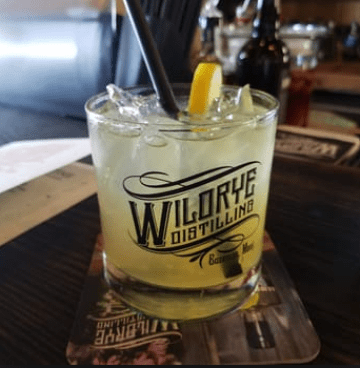 When you get to Willie’s, ask about the Montana Moonshine with jalapeno’s and pineapple, or the SnowCrest Vodka with meyer lemon and sugar (a doppleganger for Limoncello). The small-batch bourbon, aged in American white oak and enhanced with Bordeaux cherries, will kiss your lips on its way down the pie hole, and bring you back to Ennis for bliss not fishin’. Microbreweryville has a secret crush on grapes. Caressa Bailey Sack of Big Sky Wine and Spirits Academy is the educator of aspiring sommeliers in Gallatin Valley, and she let us know, “People are interested in wine because the growing regions are so different. Expression of terroire can give you huge variety in flavors and aromas. This gives us so much to talk about.” March is a time when brides are planning summer and fall events. Caressa said that wedding guests fly to Bozeman from all over the world and share excitement about the local creations of wine producers (hearty varietals that withstand the MT freeze), distilleries, and craft breweries. Expression of vines can be found at Plonk and Corx, both offer wine tasting in downtown Bozeman. 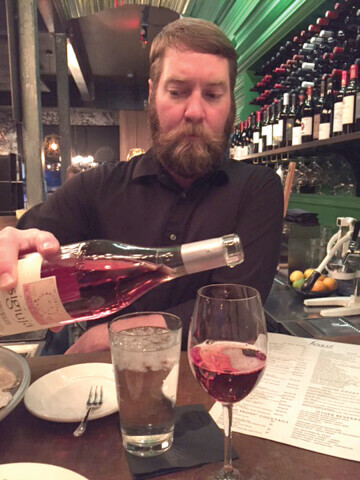 The Raw Bar at Feast Bistro lays out exquisite pairings, such as Bison Carpaccio, Stuffed Clams, or Salt Roasted Oysters with La Solitude Côtes du Rhône or Chateau des Deux Rocs Languedoc Cabrières, both from hilly regions and each a distinct canvas upon which to paint your seafood dreams. Maybe it was the contact high of the double dozen oysters from the raw bar, or the close proximity of a Scottish Stone Mason, but the Deux Rocs felt more balanced between a perfume nose and savory afterglow (no sulphite or grapeseed residue, just divine providence). The bar master can whip a mottled mojito with habanero and Prosecco into competition for any local distillery. Celebrate winter months with an “r,” especially March, the enchanting frutti di mare will soothe your soul while the vino is decanting. Conversation at the Feast bar is also a welcome respite from affairs with technology. My inner Italian requested the Da Milano Marghe Langhe Nebbiolo before coffee and dessert. The sommeliers at Feast, trained by Caressa’s school, are on to something you can discover and make your own. Thai Mule, please; that’ll be basil infused spiced Rum (rum made from Montana grown sugar beets, a prose-pirate’s bounty), coconut and ginger. The flight here was crazy-good (I made the red-haired-Carhart’s-man next to me drink the shots after each sip I took, so I saved room for the cocktails). Matt Moeller and Phil Sullivan have a contemporary vibe going on around traditional spirits. 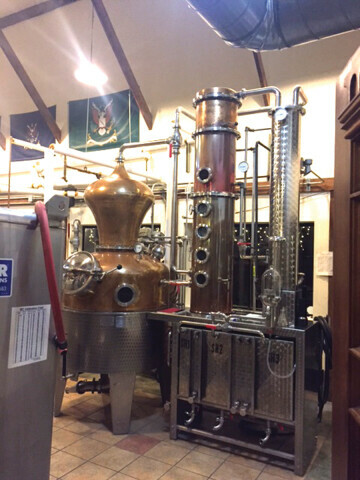 If the corn-based, non-GMO Moonshine doesn’t grab you, try the Silver rum (light, silken, and powerful), or cherry-infused Vodka, made with a few extra steps than Moonshine (cognac-like continental smoothness with a decidedly local impact). The pre-prohibition-style Old Tom Gin and the 80-proof Vodka, straight are game changers. Betty Jean, mom, always ordered an Old Fashioned at the O-Club (officer’s, natch), I tried WildRye’s Apple Pie, Bourbon, Cinnamon, and Bitters recipe – a swing dance by the glass. With a humidor room of cigars, outstanding pizza next door, and adjacent Kombucha and Craft Beer breweries, daily happy hour at WildRye from 3-5pm is not to be missed. Jim R Harris III give us a magnet tasting room on Main Street. The 1889 Whiskey, aged one year in American White Oak on a bourbon recipe (barley/rye/corn blend) has a slight oak character with eighth notes of vanilla and caramel. Loy Maierhouser and Jesse Broussard of Fermentana, LLC, both clear spirits afficiandos, and business partners promoting all things fermented at the upcoming Craft Beer Week, May 6-13, 2017, took flight with me at BSD. Jesse observed the 1889, “a really pleasant, nice sipping whiskey with no abrasiveness.” The Ruby River Gin is a stand out. Ask for a Stinger. Kids drinks and locally made bar snacks are on the menu. The BSD is a great place to meet up with friends to listen to live music, and taste the finer things of life. Brides love the Spice Girl (Cold Spring Vodka, mottled red apple, and grated ginger, with ginger beer). Let’s hang out at Bozeman Spirits Distillery, or at White Dog Brewery next door!